Ask anyone—I’m the first one to point out when non-Latino actors are in movies about Latinos (Meryl Streep, In the House of the Spirits; Marissa Tomei, The Perez Family) and am the first to trash these films to the ground. There isn’t a shortage of great actors of Hispanic heritage, only a shortage of industry folk who are willing to hire them. But something about the musical West Side Story holds a place near and dear to my heart. Maybe it's because I saw it live on Braodway as a child (oh, I was such a privileged little girl! ), or maybe it's because deep down in my core I am still a dancer, stage-fright be damned! Whatever the reason, this memorable Oscar winner deserved a second look. It is the classic story of star-crossed lovers that Shakespeare wrote about in Romeo and Juliet, retold for modern audiences via Arthur Laurents' play about a good Puerto-Rican girl (Maria) who falls for a good white boy (Tony). Their love for each other transcends the hatred their family and friends have for either side. They just want to be together, bask in their love. But no one will understand that Maria and Tony don’t see each other’s differences. They are wearing rose-colored contact lenses. The only way out of or around it is by drastic measures (oh happy dagger…). What makes this film work, even today when I am forced by societal norms to see how un-PC the movie is, is that it is still relatable. This could easily be blacks vs. Jews in 1980’s Crown Heights, or Italians vs. Chinese in Lower Manhattan—any number of groups. 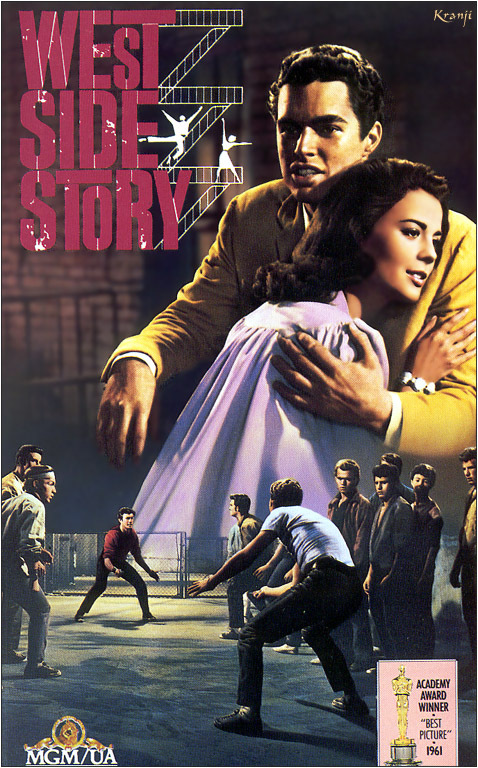 But strip away the social commentary that becomes the overarching conflict of the story, and there is still the beautiful compositions of Leonard Bernstein and the fluid choreography of Jerome Robbins, the visual candy that is the cinematography, and a great cast, regardless of race: Natalie Wood, Rita Moreno, George Chakiris, Richard Beymer, Russ Tamblyn. Immediately after the musical overture and opening credits, we close in on a bird’s eye view of Manhattan, and it’s like we’re in a time machine: New York City, 1950’s. The set design is filled with shades of grey- dull concrete colors to give you that gritty, there-be-no-streets-of-gold here feeling. We meet the Jets, and they can be any group of teens anywhere (except, maybe, they dance too much in public), doing anywhere teen things. Tamblyn’s Riff is their “leader.” Enter Bernardo (Chakiris), Head Puerto Rican in Charge, and his Sharks. They have dance-off fights (ripped off in Michael Jackson’s “Beat It” video), and play pranks on each other, harmless in nature, but hateful just the same. The dislike these two groups have for each other is played out in a carefully choreographed dance, but you forgive the fancy-pants leaps and enjoy the movements. The rest of the film gives way to peeks into each immigrant culture/mentality in lovely marriages of sight and sound. Tony (Beymer) anticipates something big in the alleyway while stocking the basement in Doc’s store; Maria (Wood) feels pretty in the dress shop she works in all day, Anita (Moreno) is “…queer for Uncle Sam” on the rooftop of her tenement. A Mambo dance-off exudes energy in the gym—neutral territory; Riff and Bernardo underestimate the power of peer pressure during the rumble; Anybodys (Susan Oakes) struggles with her identity as the first transgender teen I ever saw on screen, and Chino exacts a revenge in the heat of a moment. And through it all, you laugh, shed a few tears, yell back at the screen, and try to emulate a few musical numbers. I still get chills watching Maria run towards Tony’s body yelling, “Don’t...you...touch him!” to Lieutenant Schrank. 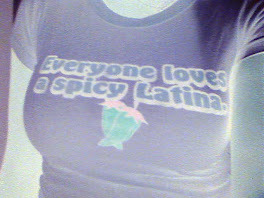 You forget that Natalie’s Puerto Rican accent is atrocious, and her dancing mediocre at best. You forgive that George is of Greek ancestry, and that Hollywood thought any olive-skinned ethnicity was that easily interchangeable. You ignore that the principle actors are not doing their own singing even when they can sing very well. You only appreciate the core of the movie: the star-crossed lovers who just want to be together. At any cost.